The bitter cold snap gripping Korea as of Friday will continue through the weekend, with temperatures in many parts of the nation plummeting below minus 10 degrees Celsius. 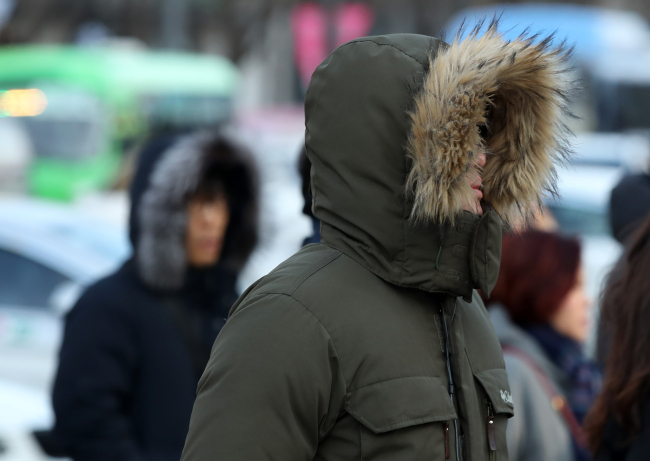 As of 10 a.m., cold wave advisories were in effect nationwide, with the exceptions of South Gyeongsang Province and Jeju Island. Chuncheon is forecast to be the coldest, with its morning low at minus 11 degrees C. Temperatures in Seoul plummeted to minus 10 degrees C in the morning, with Incheon hitting minus 9 degrees C, Daejeon minus 8 degrees C and Gwangju and Daegu at minus 7 degrees C.
The Korea Meteorological Administration announced that the cold wave advisory will be lifted during the day in the southern provinces. However, the central region will continue to witness cold weather as its morning temperatures are forecast to drop below minus 10 degrees C during the weekend. In response to the cold spell, authorities have stepped up aid for the socially vulnerable. The Ministry of the Interior and Safety announced Friday that it would supply thermal vests, heat mats, blankets and sleeping bags to elderly persons living alone, the homeless and tenement residents without heating. The ministry will also issue cold wave emergency response guidelines for foreign residents via local community centers and the websites for the Danuri Center and Korea Support Center for Foreign Workers. The guidelines are to be translated in five languages: English, Vietnamese, Japanese, Chinese and Thai.